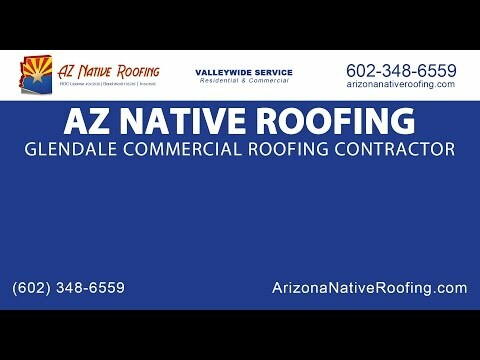 Arizona Native Roofing LLC is a locally owned and operated family business servicing Glendale, Arizona. Our Glendale roofing contractors specialize in all types of roofing, for both residential and commercial structures. Do you have questions as to whether or not you need a new roof, re-roofing or roof repairs? Do you have questions about what type of roofing material to use for your home or business? We will be happy to answer all of your questions, and advise you concerning your roof, based on our 20 years of experience in Glendale AZ. While you may not pay much attention to your roof, it plays a large part in the appearance of your home or business. It is also the first line of defense to protect you and your belongings from the weather and elements. Arizona Native Roofing offers a wide array of options including standard asphalt shingles, shake and wood shingles, tile, and foam roofing services. Our Glendale roofers will be happy to assist with your choices based on your budget and personal preferences. And you can depend on us to continue to update our products and services to bring you the latest and best in technology and materials. Our Glendale roofing company is a member in good standing with the Better Business Bureau and the Registrar of Contractors in the state of Arizona. We are fully licensed, insured and bonded, and will be happy to furnish references upon request. Our reputation speaks for itself, and our best advertising is word of mouth. We appreciate that you are considering our roofing company and would like you to become another satisfied client.